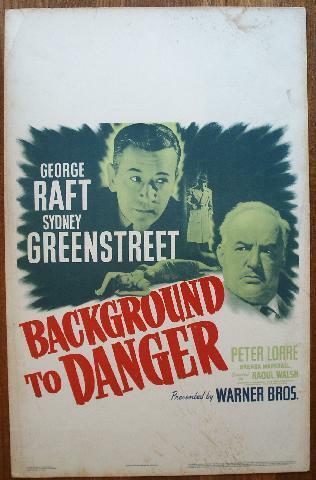 1943 - Original Vintage Window Card (14x22") for this 1943 Warner Brothers classic Background to Danger! A tale of international intrigue set in wartime Turkey, and featuring George Raft and Sydney Greenstreet, plus Peter Lorre and Brenda Marshall! Window cards were among the different format movie posters issued to movie theatres to help market and promote the film, printed on heavier paper stock like lobby cards they were/are very popular! This one is in generally very good to fine condition for a vintage window card, some splattering top right border and bottom right border, other border smudges/nits, some yellowing with age. Otherwise images themselves showcasing George Raft and Sydney Greenstreet, 2 of the great stars of the Warner Brothers film noir and intrigue studio of the 1940's are TERRIFIC!